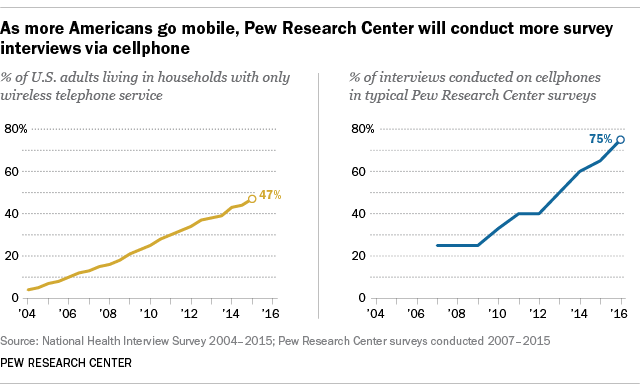 Pew Research Center will increase the percentage of respondents interviewed on cellphones from 65% to 75% in most of its 2016 telephone surveys. We’re making this change to ensure our survey samples properly represent the now roughly half (47%) of U.S. adults whose only phone is a cellphone. Nine-in-ten Americans have a cellphone, and the share of adults who are cellphone-only has steadily increased since 2004, the year the government began tracking the size of this group. To keep pace with the public’s changing habits and lifestyle, we have increased the percentage of respondents interviewed by cellphone nearly every year since 2009. Do survey researchers really call cellphones? I didn’t know that was possible. Absolutely. All major survey organizations that conduct telephone surveys include cellphones in their samples. They have to, because the kinds of people who rely only on a cellphone are different from those reachable on a landline, even though being cellphone-only is becoming more mainstream. How do you get cellphone numbers to call? I thought these were unlisted. It’s true that cellphone numbers are not listed in a directory such as the white pages. To overcome that, companies that sell telephone survey samples have to create a list of all possible cellphone numbers in the United States. They start with the fact that certain area codes and exchanges are dedicated only to cellphones. For area code and exchange combinations that include both landlines and cellphones, additional work is done to identify the specific blocks of numbers assigned to cellphones. Once the relevant area codes and exchanges (and, if necessary, specific blocks) are identified, the sample vendors append all possible last four digits to each. For instance, if they know the 202 area code and 555 exchange within that area code are only used for cellphones, then they can add every number from 202-555-0000 to 202-555-9999 to their list. They then repeat that with every area code and exchange combination known to be used only for cellphones to create a (very long) list of all possible cellphone numbers in the United States. From that list, telephone sample vendors draw a random sample of phone numbers to be used for a particular poll. Many people have a cellphone number with an area code that does not represent where they actually live. How do you know you’re getting a good sample if the location of a person does not match their cellphone? What you’re describing is a phenomenon known as “under-coverage” and “over-coverage.” This isn’t an issue in national polling, since virtually every adult we reach in the U.S. is eligible for the survey, regardless of what location we thought we were calling. However, for state and local polling, under- and over-coverage can be a big issue. For example, in a recent national poll, 8% of people interviewed by cellphone in California had a phone number from a state other than California. Similarly, of the people called on a cellphone number associated with California, 10% were interviewed in a different state. In a previous report, we discussed ways that researchers can attempt to correct this problem by attempting to merge in the commercially available billing ZIP code or full address associated with the cellphone number, though this is not available for all cellphone numbers. Why don’t pollsters include more cellphones in their surveys? The biggest reason is cost. According to federal regulations, cellphones have to be manually dialed by an interviewer, whereas landlines can be dialed automatically using a device known as an autodialer. Manually dialing cellphone numbers takes time, which increases interviewing costs. Each cellphone interview can cost almost twice as much as each landline interview. For this reason, some pollsters choose to either dial fewer cellphones or to exclude them from their sample altogether.